Earlier today, Bobby Roode arrived at the venue and was rude to the guy carrying his bag. It was kind of an exhibition for McIntyre, but Maluta did manage to get a little offense towards the start of the match. Kayla Braxton approaches McIntyre on the stage and asks him about Wesley Blake’s challenge. McIntyre isn’t concerned about it. He accepts Blake’s challenge by agreeing to a match next week. Clips are shown of Roderick Strong’s match with Hideo Itami last week. After the show went off the air, SAnitY attacked Strong. Afterwards, Strong told Regal that he wants SAnitY. Eric Young and SAnitY doesn’t normally take requests, but they will grant Strong’s wish to meet them at Takeover: Chicago. 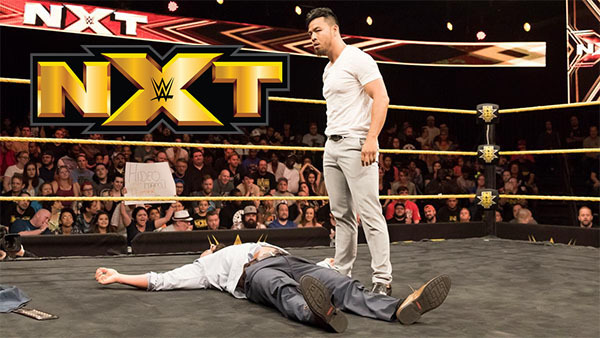 Clips of KENTA arriving in NXT and renaming himself as Hideo Itami. Clips of Pete Dunne and Tyler Bate and their match at the WWE UK Title Tournament in January. The Velveteen Dream is on his way to NXT. Clips of Hideo Itami facing Tyler Breeze in San Jose in March of 2015. Earlier today, Asuka didn’t feel like answering any questions. She also didn’t seem to enjoy interacting with any of the fans outside the Full Sail arena. Pretty good match. It was short and I expected it to be a little more evenly fought, but this was definitely Sonya’s match. She has some interesting moves, and I’m looking forward to seeing more from her. Clips of Hideo Itami challenging and attacking Bobby Roode. Good match. I felt like it took a while to get going and it wasn’t paced incredibly well, but in the end it turned out to be entertaining. The final portions of the match and the finish were good. Clips from last week’s number one contender match between Itami and Strong. Bobby Roode heads to the ring. Roode is tired of hearing about Hideo Itami. He says Itami might have knocked him out once, but it will never happen again. After a while Hideo Itami comes out and heads towards the ring. William Regal attempts to stop Itami, but Itami runs past him and attacks Roode. Itami attacks the security guards as they try to stop him. Roode attacks Itami from behind, but Itami manages to hit Roode with GTS. Roode is apparently unconscious as the show ends. Not a bad show, but it definitely felt like the last one before a PPV. Two of the three matches were short, no big story lines were really advanced, and the main event was a talking segment. Not a great match, but it was good and was easily the best of the night.